Bamberg County and its county seat were named for Local resident William Seaborn Bamberg (1820-1858) and other members of the Bamberg family. The area was a part of Barnwell County until 1897, when the new county was established. "The County lies in the southwestern part of South Carolina in the upper and middle Coastal Plain. It covers an area of about 252,800 acres, or 395 square miles." Although the area has been primarily agricultural, several towns developed along the route of the South Carolina Railroad in the mid-nineteenth century. 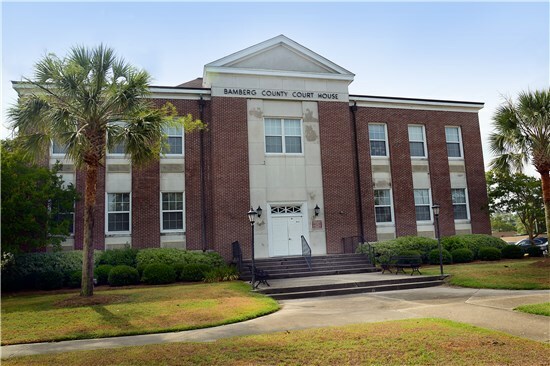 "At the turn of the century, when the county courthouse was constructed, it was given a place of prominence at the base of and overlooking North Main Street. When Highway 301 was relocated from Bridge Street to run straight through Main Street, the eastern side of the courthouse ground was incorporated into the thoroughfare, leaving one side of the temple of justice abutting on the road with no grounds between it and the building. The curve around the building was dangerous and the noise from the increased traffic interfered with the audibility of court proceedings. After fifty-three years of use the building had also become antiquated and was in need of enlarging and remodeling. 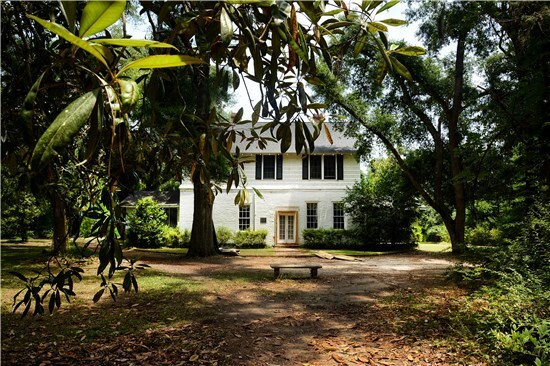 Upon the advice of the South Carolina Highway Department, it was decided to relocate the edifice across the highway on a portion of the rear grounds of the Mayflower Inn. It was necessary to build up the new groups with approximately fifteen hundred yards of dirt. The low bid for moving the courthouse three hundred feet was twenty-five thousand dollars and the actual work began early in 1950." The plantation of author William Gilmore Simms (1806-1870), Woodlands Plantation, was in what is now Bamberg County. "Woodlands was Simms's refuge for writing, for entertaining, for pursuing the managerial life of a planter, for laying out formal gardens, for running for public office, for collecting on the finest libraries of his time." In letters he wrote he stated, "The middle country is far superior to both seaboard and up county...I tell you that after traveling all over the country; to mountain sides and watering places; there is no region where you can find so great a degree of health, comfort, profit and pleasure, as in this beautifully wooded middle country of these districts." Simms, according to John Caldwell Guilds, Simms's most recent biographer, is known as the "only American author of the nineteenth century to envision, design, initiate, and consummate an epic portrayal of the development of our nation." Due to Simms's views on the recruitment of troops for the Confederacy, he lost his "professional reputation, his livelihood, and his home in 1865, at the hands of Federal invaders."